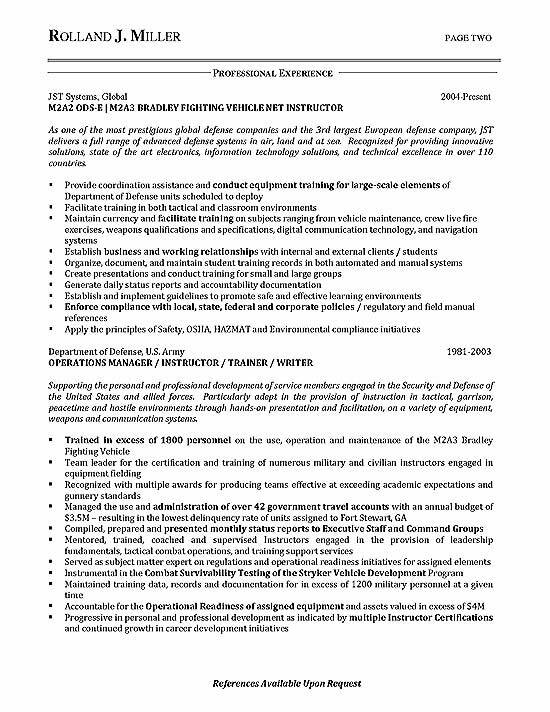 Here we have a resume for a Military Trainer and Certified Instructor transitioning into a Process Manager job position. The career transition is also suitable for people moving into high level program or project management. The resume uses the job title in large font to highlight the target of Program / Fielding Process Manager. The sub headline documents their expertise in planning, scheduling and managing tactical and communication systems. The summary also identifies job knowledge that includes project management, training, tactical and logistics. 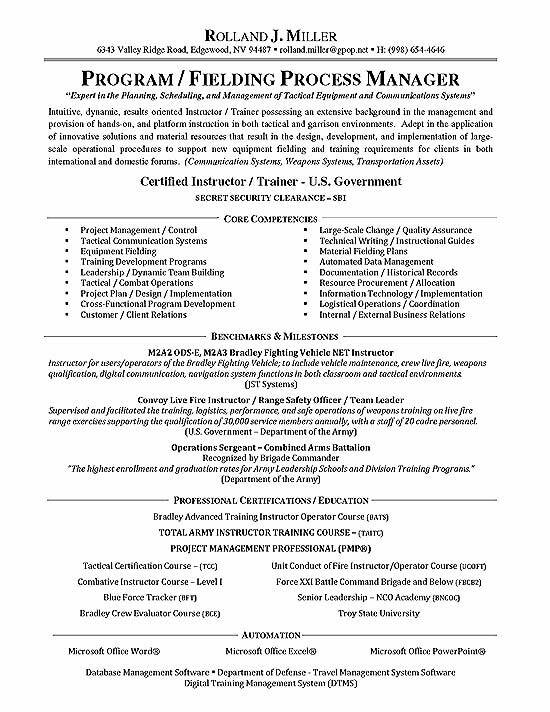 Additional skills are listed such as procurement, planning and quality control. This information can be quickly found in the core competencies area. The job seeker also shows their training with the prestigious PMP Project Management Professional certification. The job experience section is that the bottom. The resume uses standard job headings and job titles. The paragraphs outline scope of responsibility at each position. The bullets highlight achievements and key projects. Oversee large process initiative projects and manage smaller process improvements. Analyze information collected on various procedures to determine weaknesses and necessity for improvement. Perform cost benefit analysis on multiple projects to create a prioritized list. Ensure process improvement results in reduced process cost, enhanced quality, decreased cycle times and reduced errors / omissions. Review process breakdowns and develop solutions to ensure process continuity. Create process documentation including guidelines, flow charts, diagrams and graphs. Coordinate with senior management to relay status reports and project milestones. Support implementation of new processes, transition from older procedures and general training. Process Manager Resume Example By Career Wizards Inc.